The following is an extract from our book, CSS Master, written by Tiffany Brown. Copies are sold in stores worldwide, or you can buy it in ebook form here. Developer tools help you find and fix rendering issues, but what about efficiency: are our file sizes as small as they can be? For that, we need minification tools. Now our CSS is only 80 bytes long and 18% reduction. Fewer bytes, of course, means faster download times and data transfer savings for you and your users. In this section, we’ll look at CSS Optimizer, or CSSO, a minification tool that runs on Node.js. 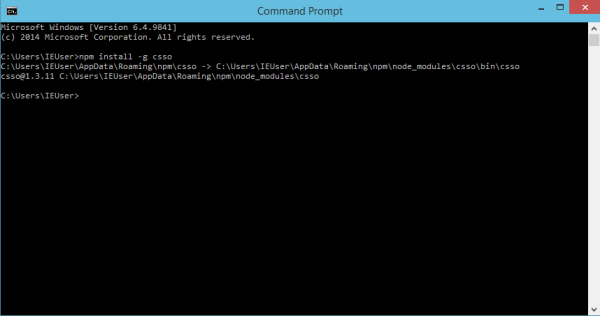 To install CSSO, you’ll first have to install Node.js and NPM. NPM is installed as part of the Node.js installation process, so you’ ll only need to install one package. Using CSSO does require you to be comfortable using the command-line interface. Linux and OS X users can use the Terminal application (Applications > Terminal.app for OS X). If you’re using Windows, utilize the command prompt. Go to the Start or Windows menu and type cmd in the search box. The -g flag installs CSSO globally so that we can use it from the command line. OS X and Linux users may need to use sudo (sudo npm install -g csso). You’ll know it’s installed when NPM prints its installation path to the command line window, and the command line prompt reappears, as depicted in Figure 3.25. Now we’re ready to minify our CSS. This will perform basic compression. CSSO strips unneeded whitespace, removes superfluous semicolons, and deletes comments from your CSS input file. CSSO removed extraneous spaces, line breaks, and semicolons, and shortened #ff6600 to #f60. CSSO also merged the margin and margin-left properties into one declaration (margin: 20px 30px 20px 0) and combined our separate h1 selector blocks into one. Now our CSS is minified, but not optimized. Disabling restructuring will keep your CSS files from being as small as they could be. Avoid disabling restructuring unless you run into problems. Preprocessors, introduced in Chapter 9, offer minification as part of their toolset; however, using CSSO can shave additional bytes from your file sizes. Tiffany B. Brown is a freelance web developer and technical writer based in Los Angeles. Brown offers web development and consulting services to larger agencies and small businesses. A former member of the Opera Software developer relations team, Brown is also co-author of SitePoint's JumpStart HTML5 book. She sporadically writes about web development technology on her blog. You can follow her on Twitter at @webinista.